Rodgers and Hammerstein’s hit Broadway musical comes to Cape Town in 2019. This much loved classic is on at the ArtsCape Opera House from 20 July to 10 August 2019. 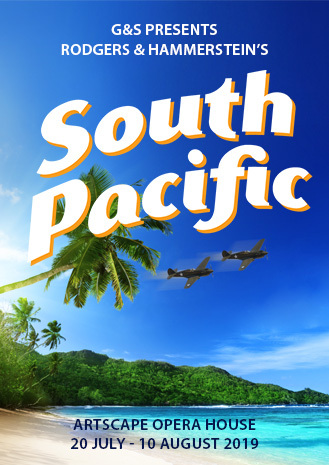 This epic musical romance is set on a South Pacific island during WWII, where American sailors and nurses are stationed. Nellie, a spunky nurse from Little Rock, Arkansas, falls in love with Emile de Becque, a French expatriate and plantation owner, and Lt. Joseph Cable finds himself in a passionate affair with Liat, the young daughter of Bloody Mary, the local grass-skirt peddler. As the war against Japan escalates, reality sets in for both Nellie and Joseph, who struggle to reconcile their unconventional love affairs with their long-held prejudices and insecurities. The show will run for a total of 22 performances, accompanied by the Cape Town Philharmonic Orchestra, featuring hit songs like “Some Enchanted Evening”, “I’m Gonna Wash That Man Right Out Of My Hair”, “Bali Hai”, “There’s Nothing Like A Dame”, and many more!